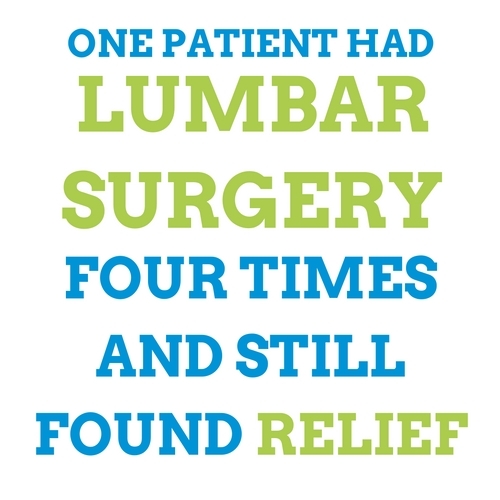 One Patient Had Lumbar Surgery Four Times in 70 Years + Found Relief. That’s four times that a patient of Barefoot Rehab went under the knife and had his body opened up. For most people, being opened up scares the bejesus out of them. It’s immediate fear. Kind of like how standing in a plane with the door open, preparing to jump out and skydive, makes me want to pee my pants a little. Why would anyone ever do that? His pain was so bad that lumbar surgery was the only thing that inspired hope to finding relief. Can you imagine being in that much pain? For months? Years? If it was me, I’d probably wake up. Praying that when I sat up, the pain would be gone. Only to sit up and realize that my prayers went unanswered. Immediate dread would set it. I’d “zombie” my way through the morning. Looking outside of the windows into the sunny world and think “Why isn’t it sunny in my head?” I’d go to work, desperately pleading with my heart to show up for the people who need me. As I deliver my production, the weight of my own suffering would start pushing down on my shoulders until it felt like I was two feet into the ground. The day would continue and my pain would only amplify in intensity. Like someone turned up the burner on the stove from medium heat to high. By the end of the day, I’d be wishing to not exist as the pain became insurmountable. Probably drowning those wishes in alcohol (or the much healthier medical marijuana if my state would allow me to, I digress), wondering how I would relive the same existence the next day. Oh wait, I’ve already lived that. But Richie? He found Barefoot Rehab. Just wanted you to know that your alternative chiropractic techniques have provided me with much more optimism as I approach 70 years of age. A lifetime of sports and physical strain has taken its toll. After four lumbar surgeries and a neck fusion, I have had much time to research solutions. ART has been the most productive of techniques and filled a void where traditional medicine faltered. Whether I come to you in crisis or maintenance, you have been there; your patience and thorough understanding are welcoming. Now that I have learned so much about healing and my body, I wish you could influence the medical community at large [bold is mine]. I don’t know about you, but I can easily put myself in someone’s shoes who has had four surgeries and is skeptical about how anyone could help them. That’s why I decide to take Richie’s bold wish and share them with all of you. You aren’t either, whether you’ve had lumbar surgery, four surgeries, or zero. To find relief, you need to follow Richie’s path. That’s the path where you accept reality, respect the choices of paths in front of you, then choose the most promising one based on a collection of the data that you’ve sifted through. Below, I look at the data by your side. Why Are You Still Hurting? If you get surgery and the pain hasn’t changed at all, the problem wasn’t addressed. Hopefully, that’s obvious to you. The question becomes, why are you still hurting? Are you weak? While surgery repaired the disc, does the constant postural stress that your body puts on your spine when you walk, sit, and even sleep mean that there’s no chance for relief without strengthening to put your spine in a position that relieves the damaged area of the spine? Has anyone ever looked at your gut for a chronic infection or have you done an elimination diet to see if you’re intolerant of a food? While not my area of expertise, I’ve seen patients in chronic pain who found relief when they killed off the bad bacteria that had lived peacefully inside of their guts for 20 years or eliminated gluten, dairy, or sugar from their diets. Adhesion is excessive glue between your muscles, ligaments, tendons, nerves, and skin. Brain, [Your name] isn’t letting our muscles recover, and he’s not getting stronger to handle the work/stress he’s doing. We need to do something about it. Lay down adhesion so we don’t have to spend more energy and resources in trying to heal these muscles. Then, your body puts down spackle (adhesion). It’s way sturdier than rubber bands (muscles). Requires less energy too. In our office, most patients know the answer to the question of why, whether they admit it or not. The 5’8″ male who weighs 260 pounds knows the weight needs to come off. The 90 pound woman who has never worked out a day in her life knows she needs to have a baseline level of fitness to garden the way she wants to and prevent a hip fracture if she falls. The overworked CEO who flies 3 weeks a month and has babies at home knows the stress is weighing on him. If you know the answer, you’re ahead of the curve. Now, do something about it. The only potential problem most people do not have an underlying awareness of is adhesion. 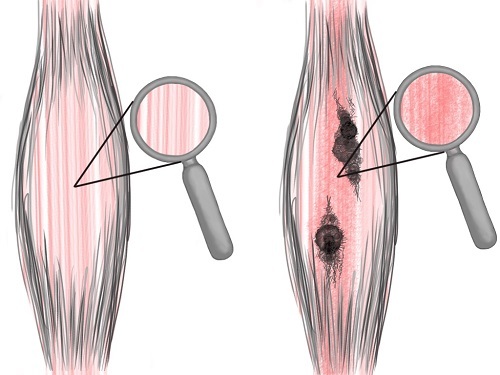 Adhesion is the most common cause of musculoskeletal pain that no one is talking about. It’s also easily treatable conservatively by doctors who know how to find and remove it. Further down the rabbit hole of “why?” is knowledge of oneself. If you don’t know the health problems you’ve been avoiding, I offer that you could know if you look. Conscious mindpower is like a spotlight. Shine it around your cranium, inside of your chest cavity, and throughout your life and you’ll be surprised at how your perspective changes. A few thoughts to help you find relief if you don’t have a trusted healthcare provider to help you walk the pain path like Richie did. Sit down in a low lit, comfortable place. Preferably at the end of your day. Take a deep breath and close your eyes. Go into your pain. What do your symptoms feel like? Numbness, tingling, lightning = NERVE pain. Nerve pain needs nerve solutions. Dull, achiness = ADHESION pain (most often). ADHESION pain needs adhesion solutions. Pain that doesn’t change with posture or movement = NON-MUSCULOSKELETAL pain, with a major suspect being cancer. Cancer pains need cancer solutions. After you tune into the feeling of your pain, ask yourself, what makes the symptoms worse? Pain that is worse after prolonged sitting, standing, in a mid-range of motion, or first thing in the morning getting out of bed = DISC pain. Disc pain needs disc solutions. Pain that is worse first thing in the morning getting out of bed OR at the beginning of activity that goes away as you warm up = ARTHRITIC pain. Arthritic pain needs arthritic solutions. Pain at the end of a range of motion = ADHESION pain. ADHESION pain needs adhesion solutions. Hip pain that feels as if your hip is “hanging by a thread” = LABRUM pathology. Shoulder pain that is present in a mid-range of motion = LABRUM pathology. Disc problem? No amount of chiropractic adjustments is going to help you. In fact, they’ll only speed up the degeneration of your discs. There’s a very strong probability that any amount of time that you can spend away from a chair will give you relief. Arthritis problem? Cut the tennis play from 8 hours to 3 hours. The amount of hours is what your body can handle (your capacity) without experiencing increased pain the next day. Keep load less than capacity and your arthritis won’t progress as quickly over time. Labrum problem? An Integrative Diagnosis provider can manage this for you and potentially keep you out of the surgeon’s hands. Still, a large majority of these cases will need to consult with the surgeon. Richie is a messenger to tell you that there is hope. Even if you had lumbar surgery four times. It could be through finding an adhesion provider wherever you live in the world, losing the weight you’ve known that you have to get rid of, coming to Barefoot Rehab if you live in the NY/NJ area, or seeing whatever specialist claims to be able to solve the thing that you think might be going on. Like Richie did, you can’t stop looking for solutions. You’re inaction is your acceptance of a less than full life. When you’re ready to choose a pain doctor or any other type of health-enhancing provider, take ten minutes to read The 7 Biggest Mistakes People Make When Choosing a Pain Doctor to save yourself some trouble. Or if the person who is suffering is your friend, ask them 8 questions that are guaranteed to help them get out of pain. You owe your heart as much health and happiness as you’re able to experience. How did you find relief after surgery didn’t work? What worked for you when nothing else did? Was it losing weight? Eliminating gluten? Removing adhesion? Seeing a psychotherapist? Getting acupuncture? Please share below.